Relational XQuery systems try to re-use mature relational data management infrastructures to create fast and scalable XML database technology. This paper describes the main features, key contributions, and lessons learned while implementing such a system. Its architecture consists of (i) a range-based encoding of XML documents into relational tables, (ii) a compilation technique that translates XQuery into a basic relational algebra, (iii) a restricted (order) property-aware peephole relational query optimization strategy, and (iv) a mapping from XML update statements into relational updates. Thus, this system implements all essential XML database functionalities (rather than a single feature) such that we can learn from the full consequences of our architectural decisions. While implementing this system, we had to extend the state-of-the-art with a number of new technical contributions, such as loop-lifted staircase join and efficient relational query evaluation strategies for XQuery theta-joins with existential semantics. These contributions as well as the architectural lessons learned are also deemed valuable for other relational back-end engines. The performance and scalability of the resulting system is evaluated on the XMark benchmark up to data sizes of 11 GB. 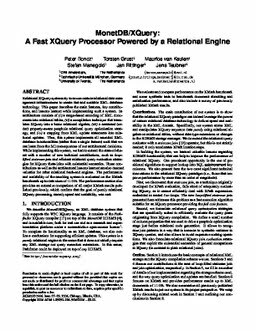 The performance section also provides an extensive comparison of all major XMark results published previously, which confirm that the goal of purely relational XQuery processing, namely speed and scalability, was met. Boncz, P.A, Grust, T, van Keulen, M, Manegold, S, Rittinger, J, & Teubner, J. (2006). MonetDB/XQuery: A fast XQuery processor powered by a relational engine. In Proceedings of ACM SIGMOD International Conference on Management of Data 2006. ACM.